The Season XVI WPT Tournament of Champions is around the corner. On Thursday, May 24, 2018, World Poker Tour title holders will embark on fabulous Las Vegas to compete in the prestigious event at ARIA Resort & Casino. The final table will play out at Esports Arena Las Vegas at Luxor Hotel & Casino on Saturday, May 26. In lead up to the event, WPT.com is featuring all of the winners from Season XVI, who, along with the hefty first-place prize, earned a $15,000 seat into the season-ending WPT Tournament of Champions. Next up is Scott Margereson, who topped a field of 1,309 entries in the WPT Seminole Hard Rock Poker Showdown Championship to win $696,740. The largest field of Season XVI on the World Poker Tour assembled in Hollywood, Florida, for the WPT Seminole Hard Rock Poker Showdown. Most of the 1,309 entrants hailed from the United States, as five of the final tablists had the stars and stripes next to their name. Scott Margereson was an outlier in the field and lives as an outlier in the world of WPT Champions Club members. The 25-year-old was born in the United Kingdom and lives in Playa del Carmen, Mexico, where he applies his trade as an online poker player. Two PokerStars World Championship of Online Poker wins combined with a Sunday Million victory add up to Margereson being a beast at finishing tournaments. Overall, his online winnings total more than $4.1 million. The $696,740 won by Margereson in Florida is a career-best in any format. Margereson made an intentional decision to play the WPT Seminole Hard Rock Poker Showdown over the partypoker MILLIONS taking place simultaneously in Barcelona. To him, the field in Florida offered less competition. Live tournaments aren’t on Margereson’s radar outside of events at Seminole Hard Rock and the Las Vegas summer. His game selection skills served him well. Chipping up early in an event followed by making the money and then shifting toward the final table is a routine for Margereson. The Brit bagged more than 100,000 heading into Day 2 and then moved up to third on the leaderboard before Day 3. Then, Margereson accumulated in a hurry to the point of being the chip leader with 14 left and Day 4 to follow. Margereson took a tough cooler against Brian Hastings to lose his chip lead prior to the official final table. The hand was worth tens of thousands in equity, but Margereson barely batted an eye. His experience in final table situations was worth more than the ICM loss. At the televised final table, Margereson hid behind his hoodie during the intense action and paddled through the 232 hands it took to secure his victory. Ten hours is often the length of a deep-structured online event. The WPT final table took about that long and finished off a week of poker. When Margereson won the Sunday Million in April 2015, he vanquished a field of 6,393 to win $194,479 in a tournament that leans on the longer side at over 12 hours of play. Margereson says it is hard for him to compare a major win online versus a WPT title, but is pleased with the overall outcome. A single win on the WPT Main Tour motivates Margereson to play more in the upcoming season. The limited time banks in an online tournament are simulated through the Action Clock, presented by Protection Poker, and Margereson enjoyed the logistics of the format for the better part of four straight days. The WPT Tournament of Champions features the Action Clock for the duration and offers a new chance for a player with 4,677 online cashes, according to PocketFives, coupled with 32 live scores to test his skills. Margereson is unsure about how to forecast the event but finds positives in the details. The online poker community is represented by Margereson in the WPT Tournament of Champions. Winners in previous seasons may have come from an online background by Margereson is one of a select few who still builds a living in that realm. Recent WPT champions with a backbone created on the virtual felt include WPT L.A. Poker Classic winners Dietrich Fast, Daniel Strelitz, and Chris Moorman, along with James Mackey, Jonathan Jaffe, and two-time WPT Champions Club member Mohsin Charania, just to name a few. WPT Seminole Hard Rock Poker Showdown final tablists Brian Hastings, Matt Stout, and Faraz Jaka all paid their button-clicking dues. Most of these players stick to a live schedule now. Margereson does not anticipate joining them in that endeavor. In fact, Margereson’s schedule is already booked with another $10,000 buy-in tournament that conflicts with the season-ending WPT Bobby Baldwin Classic. 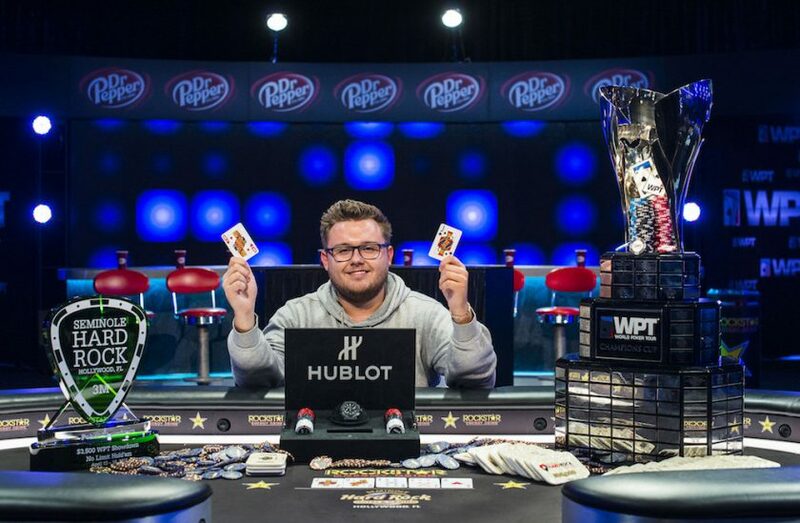 The summer opens for Margereson with the WPT Tournament of Champions and perhaps a second win in as many months. The “Aggro Santos” handle remains the primary calling card for Margereson, but another deep run and televised appearance might soon start to change that.